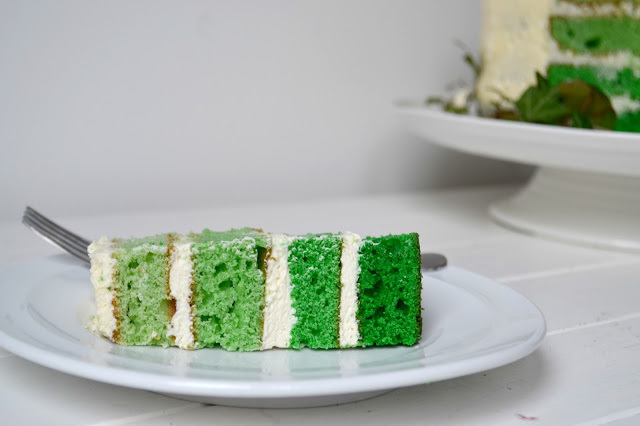 Given that Saint Patrick's day is on the horizon, I thought it might be nice to share a cake, simple in it's virtue but packing a nice punch once cut open. 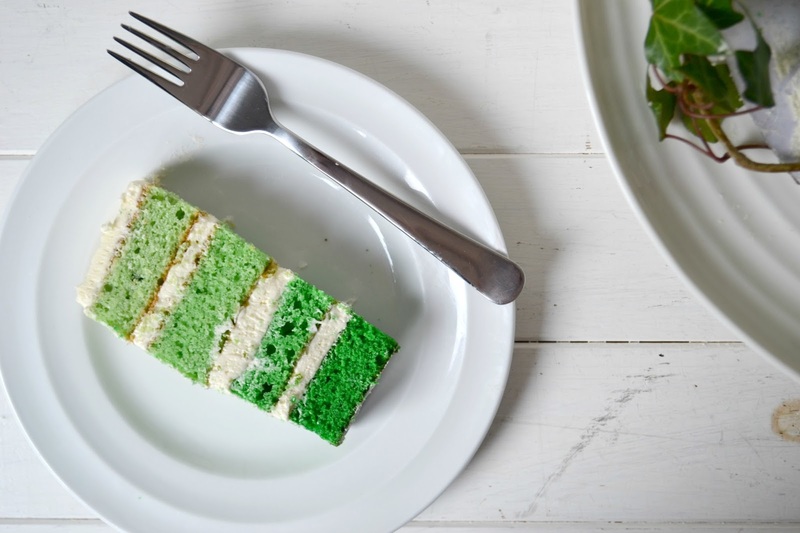 This ombre layer cake, named because each cake layer is a shade, gradient lighter or darker than the next, is the perfect way to celebrate in style this feast day. 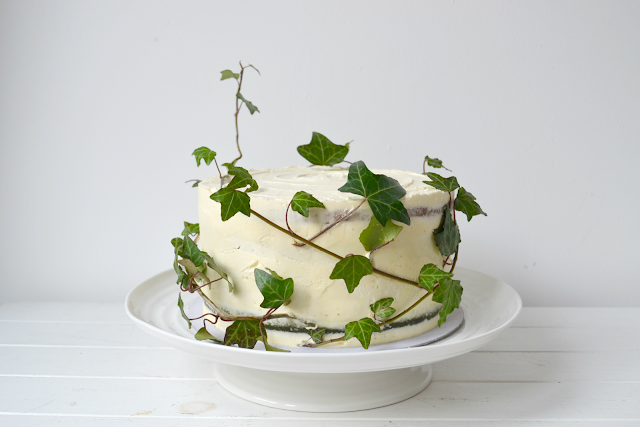 A cinch to whip together, the cake is subtly flavoured with white chocolate and Irish Creme. Avoiding the heaviness of a traditional fruit cake or chocolate and Guinness, the light airy sponge complements the soft, fluffy frosting. 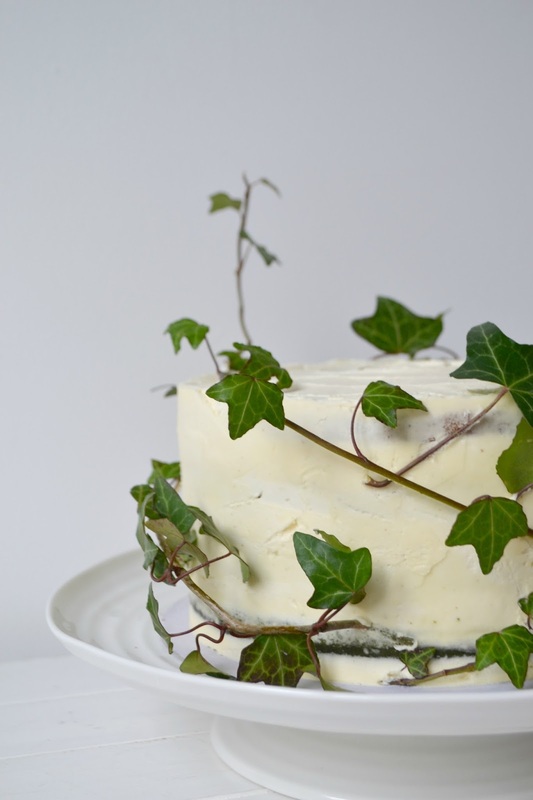 Dressed in common garden variety ivy, it makes a happy center piece to your dinner party table. Line 4 8 inch cake tins with parchment and leave to one side. If you only have two, cut out 4 parchment circles and put two aside. Preheat your oven to 350F, 180C, 160C fan or Gas mark 4. In a bowl cream your butter and sugar until light and fluffy and pale. Add in an egg, one at a time until the yolk has disappeared. Then add the next, scraping down the sides of your bowl. Add the white chocolate to the egg/sugar/butter combination. Add half your dry ingredients to the butter/sugar/egg/vanilla mix and then half the buttermilk. Mix until combined and repeat. Be careful not to over mix the batter here as you want the layers to stay light and fluffy. The buttermilk helps with that too. Just make sure all the ingredients have been mixed together. Separate the batter into 4 bowls and colour each bowl with the green food gel. Try and keep the gradient of colour a shade off the last bowl if possible. Transfer the green batters to the tins and bake in a preheated oven on the middle shelf. Bake for 20 to 25 minutes. You'll know when they are done as the tops are golden, have a slight spring when you gently push down on the top or a skewer inserted in the middle comes out clear. Allow to cool in the tins for about 10 minutes, then turn out onto a wire tray and allow to cool fully before filling. (If you need to reuse your tins, give them a quick wash out before you use them again). Add in the icing sugar a few teacups at a time. Add a tablespoon of Irish Creme in until the desired taste has been reached, you might not need all of it. Once the cake layers are cool, sandwich each layer with a good helping of the buttercream, Finish off the sides and top of the cake with the left over buttercream. 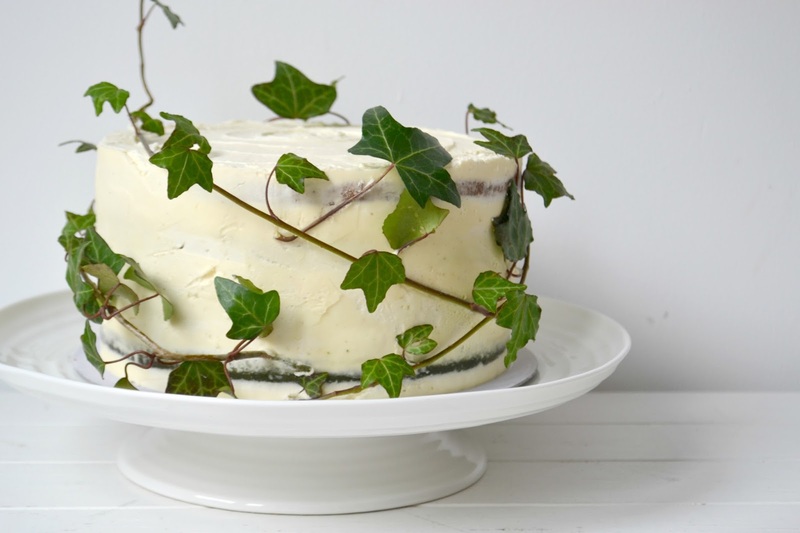 Decorate or garnish your cake with some ivy or even shamrock... given the week that's in it! Enjoy at room temperature with your favourite coffee. Oh my! That is a thing of beauty!